Surrounded by three mountain ranges, this town lies inside the Tagus International Nature Reserve. Its heritage attests to the different cultures that have settled there since prehistoric times. Founded by the Romans, it was later taken over by the Visigoths until the 13th century. Its proximity to Portugal left its imprint on the following centuries until the town reached its period of greatest splendour in the 16th and 17th centuries with the building of its most representative monuments. A good place to begin your stroll around Valencia de Alcántara is the Jewish-Gothic Quarter, which has been declared a Site of Historic and Artistic Interest. The area is dotted with palaces and mansions with their porches and pointed arches, you will also come across a synagogue there. Nearby you have the Church of Nuestra Señora de Rocamador, declared to be a Monument of Historic and Artistic Interest. It was built over a Roman temple and houses a Baroque altarpiece by José de Churriguera, among other works of great value. From here, head for the castle (13th century), which is a must on your visit to the town. Its keep and fortified enclosure house a splendid library. You should also have a look at the Convent of Santa Clara or the Church of the Encarnación. On your walk, be sure to pass through Plaza de Gregorio Bravo (which is home to a beautiful, 19th-century marble fountain), as well as Plaza Mayor, paved as it is in Portuguese style. 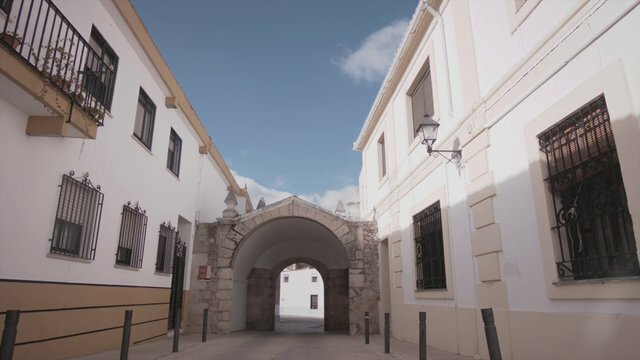 In spite of the beautiful wood that surrounds the town, with its typically Extremadura-like estates, the main tourist attraction is undoubtedly the Neolithic dolmens and other Bronze Age constructions that have been preserved in the district. There are several routes you can explore to see these prehistoric monuments, while at the same time delighting in the beauty of the surroundings. On your return from one of these walks we recommend that you try the "chanfaina" (lamb stew accompanied by potatoes or rice) to get your strength back. If you have a sweet tooth, you're definitely in the right place: try the "frutos borrachos" (fritters), "tortas de chicharrones" (pork scratching cakes) or the "bollos de Pascua" (Easter buns), they're simply delicious.